This is a bad idea for many, many reasons. Here are a few. The FCC’s decision to gut net neutrality protections isn’t just partisan business as usual; it’s a withdrawal from over a decade of work to protect Internet users from unfair practices by Internet service providers. While the FCC’s approach has changed over the years, its goal of promoting net neutrality did not. Two years ago, it finally adopted legally enforceable rules, most prominently bright-line prohibiting ISPs from blocking, throttling, and creating Internet “fast lanes” that would favor some sites and content over others. But, as the saying goes, “elections have consequences.” One consequence of the 2016 election is that the FCC has new leadership that feels free not just to change the rules, but to get rid of them altogether. Because the draft order repeals net neutrality rules altogether, it allows ISPs to block or throttle lawful content, or give the highest-paying websites and apps a better ability to reach customers’ devices, or to favor Internet traffic from the ISPs’ own subsidiaries and business partners, all without any legal repercussions. It paves the way for an Internet that works more like cable television, where wealthy insiders decide which speakers can reach a broad audience. A pay-to-play Internet means that smaller sites and apps, or startups without major funding, will be forced to negotiate with multiple ISPs to avoid their content being buried, degraded, or even blocked. The FCC’s decision to gut net neutrality protections isn’t just partisan business as usual; it’s a withdrawal from over a decade of work to protect Internet users from unfair practices. The draft order claims that “latency-sensitive” applications will benefit from paying to connect to you faster and more reliably, while other apps and sites will continue to work as they do today. But without rules, nothing will require ISPs to give the same quality of service even to apps that pay the same amount, let alone those that can’t afford it. Content from an ISP’s business affiliates or favored partners will be able to get a fast lane no matter how much another website or app is willing to pay. The order justifies its conclusions by cherry-picking some economic analyses that support them, while ignoring the harms to free speech that flow from paid prioritization. Weirdly, the proposal acknowledges the fears of “non-profits and independent and diverse content producers” who spoke up this year to say that pay-to-play Internet access is harmful. But it dismisses these concerns, saying that these speakers “may be less likely to need [quality-of-service] guarantees.” Not surprisingly, it doesn’t explain why non-profits and independent content producers don’t need the same access to Internet subscribers as major media companies do. The FCC’s proposal attempts to paper over its abdication of regulatory responsibility by insisting, mistakenly, that the Federal Trade Commission can adequately protect Internet subscribers. The idea is that ISPs have to be forthcoming about their practices, and if those practices harm consumers or competition, the FTC (and/or private antitrust lawyers) can hold them accountable. The most basic problem with this theory is that it doesn’t actually forbid unfair data discrimination practices. If a company is forthright about its intent to sell your private data, block competitors’ content, or throttle competing apps, then the FTC will do nothing. And unlike clear net neutrality rules provided under Title II telling ISPs and the public what is and is not forbidden, the FTC only acts on a case-by-case basis after harm has occurred. The agency has no power to issue rules that prevent that harm in the first place. Finally, ISPs have been working hard to defang the FTC in court, with some success. Recently, AT&T won a case in federal appeals court establishing that it was immune to FTC oversight because it operated a telephone service. Though the decision has been vacated pending further proceedings, ISPs now stand a good chance of getting both the FCC and the FTC out of the picture, leaving customers without an advocate in the federal government. What is worse, even the transparency rules have been pared back, on the assumption that customers don’t really need detailed information about network performance. But those metrics are crucial to identifying non-neutral practices. And the draft order suggests that the FCC won’t even enforce the transparency rules in any meaningful way. Without the ability to double-check how ISPs are behaving, we'll be left taking their word for it. That obviously would make it very difficult to persuade the FTC that the companies are saying one thing while doing another. Net neutrality is sometimes thought of as a competition problem: if users could vote with their wallets and switch providers, ISPs would be more likely to respect their preferences. Following this line of thinking, the new proposal insists that antitrust lawyers (at the FTC and in private practice) can police anticompetitive behavior. Unfortunately, this won’t work. Antitrust enforcement is in such dire shape when dealing with regulated industries like ISPs that the FTC itself warned Congress about it years ago. Thanks to two Supreme Court decisions (one of which involved Verizon), the courts are likely to deny access to antitrust remedies so long as the industry is regulated by a sector-specific statute and agency. The intent behind the rulings was to ensure that expert agencies administrating sector-specific laws handle disputes rather than generalized knowledge courts. In this instance, the expert agency and statute are the FCC and the Communications Act. Notably, the new proposal ignores these Supreme Court decisions. Curiously, the new proposal ignores the current competition problem. It insists that the ISP market is competitive, even though a majority of Americans have only one choice of ISPs for high-speed broadband access of 100 mbps and up. That lack of choice isn’t a problem, the proposal suggests, because monopolies that face competition in some areas will act like they face competition everywhere. Even the evidence that shows that people rarely switch providers is treated as a sign of customer loyalty to the regional monopoly. Those times when Comcast refuses to cancel your cable subscription? Proof that the cable company is aggressively competing for your dollars. At the core of the FCC’s contorted vision of the competitive landscape is the effort to lower our expectations by examining only the broadband market of 25 mbps downstream and 3 mbps upstream, which are relatively slow speeds today. Even at that level, the FCC found the market to be “moderately concentrated,” which, under the Department of Justice’s own guidelines, can be a source of “significant competitive concerns and often warrant scrutiny.” In fact, the FCC’s view of the competitive landscape directly contradicts the DOJ’s finding that large ISPs have the power and intent to stifle online competition—a stance the DOJ took just last week in its lawsuit to block AT&T’s merger with Time Warner. The new proposal’s final justification for abandoning neutrality rules is that tech companies will police ISPs for us. In other words, ISPs won’t engage in unfair discrimination because Google, Facebook, Amazon, Netflix, and others will exert their own pressure against it. This argument misunderstands a fundamental purpose of network neutrality: ensuring that the Internet remains an open field so that the titans of today can be disrupted by the startups of tomorrow. Google and Facebook aren’t going to do that for us; it is not their job to protect the interests of users, much less future competitors. That is why literally thousands of small businesses (including small ISPs, which the FCC completely ignored) have asked the FCC not to abandon its responsibility to navigate the public interest in the Internet. They have no reason to believe the biggest corporations will act on behalf of everyone else. Their skepticism is justified. Think back to when Google and Verizon tried to sell the public on a deal that allowed them to favor their own products. Or when Facebook endorsed AT&T’s antitrust-violating merger with T-Mobile that would have raised prices on everyday wireless consumers. Or Netflix’s CEO Reed Hastings’ suggestion (later withdrawn) that the company would be walking back their fight for network neutrality. Each of these were major decision points for Internet policy and all of them were crafted to serve their shareholder interests (which is expected since that is the first responsibility of a corporation). There are many more flaws in the FCC’s proposal, which we will discuss in future posts (for example, the FCC’s continuing confusion about how the Internet works). But the key takeaway is this: the FCC is repealing, not replacing, principles and rules that have been crucial to the growth of the Open Internet. 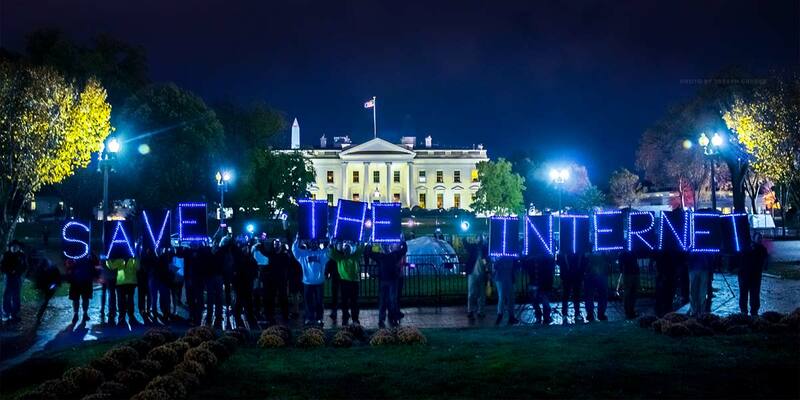 That means the fight for net neutrality moves into a new phase – and we’ll need your help. The best way to help right now is to contact Congress. But don’t stop there – we’ll need some offline noise to protect online speech. Activists are planning protests around the country and in DC – if there’s one in your area, come out and make your voice heard. And if the FCC nonetheless continues to ignore public outcry and the public interest, we’ll have a new front: the courts. The proposed rules have any number of legal flaws, and we will be happy to point them out to a judge. The FCC may be abandoning its role in protecting the Internet, but we won’t.